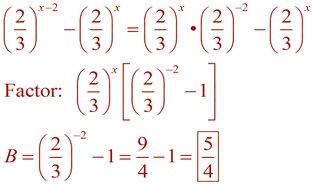 An exponential expression is one which contains an exponent. Simplify the following expressions into the form a•bx. Solution: Get a common base. You may be asked to re-write an exponential expression in a simpler form, as seen above, to make it more easily readable. Or you may be asked to re-write the expression into a more obscure form to reveal pertinent information about a concept or about the expression itself. Solution: Let's see if we can re-write the left-hand side to contain an exponent of simply x. Better, but not good enough. If we cannot simplify the left-side further, how can we manipulate what we have into becoming K x ? Solution: We need the exponent on 4 to contain a 3. We can introduce 3•1/3 (which equals 1) without changing the expression. Solution: Separate the exponent to produce the x alone. Find B. Solution: Re-write the first term and then factor. Solution: Yikes! Let's work on that exponent first. OK, so far, so good. Now, work on the -1 by adding a 0 as -1+1.